See fewer blackheads in just two days! 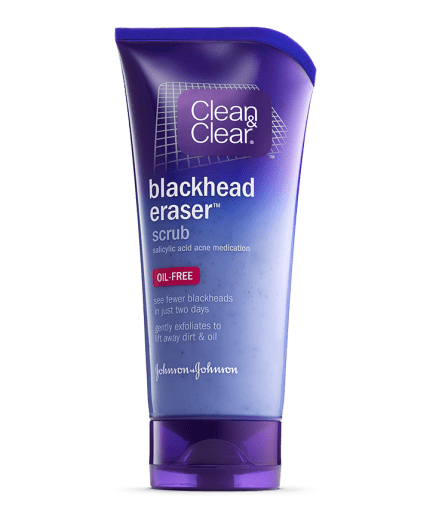 CLEAN & CLEAR® BLACKHEAD ERASER® Scrub has unique exfoliating multi-action beads that work to gently remove the trapped dirt, oil, and dead skin that can clog pores and lead to breakouts. Three sizes of multi-action beads allow surface exfoliation and a deep down clean. Salicylic Acid, an acne fighting medicine, clears blackheads and helps prevent new ones from forming. Use those clean hands to splash water on your face. Squeeze a small amount of cleanser onto wet palms – a dime-size should do it. Gently massage the cleanser all over your face for about 20-30 seconds. Rinse thoroughly then pat your fabulous face dry with a towel. Give yourself a big smile. I loved former cleanser Blackhead clearing daily scrub. It looked the same, smelled the same. But it contained better ingredients such as panthenol, chamomilla recutita extract, aloe barbadensis gel, bisabolol. But it is no longer available and I do not want to use this new product. It has nothing of the good stuff. And I really hate the little blue beads. Made me break out even worse. I didn't notice a huge change in the number of blackheads I had, but my face started to break out really bad after just one use. My face also gets really red after each use, and the redness doesn't go away for hours. I didn't realize it was this product until I used it regularly for weeks, hoping it would eventually clear up, but it's as bad as ever. I'm throwing away a basically full tube. We're sorry to hear this and want to learn more. Please give us a call at 1-877-754-6411. We're available Monday-Friday 9AM-5:30PM ET. When you call mention your username to our team. We hope to speak with you soon! This product has great features. I'm very lucky that I have very smooth and clear skin, I never get spots or suffered with acne as a teenager. I noticed some blackheads appearing on my nose so though I would give this product a go. After the 1st use my skin became supper aggravated and very very dry. my face is now bumpy and red and no amount of moisturiser is smoothing out my face or taking away the dryness. Super disappointed and angry with this product, don't know how long it will take to fix my face. We're very sorry to hear that this was the reaction you had with our product. We'd like to learn more about this. Please give us a call at 1-877-754-6411 M-F between the hours of 9A-5:30P ET. Thank you and have a great day! I just used this product only to realize it had left very small blue crystals in my skin. Hi, thank you for sharing your experience with us! We’d like to learn more about what happened, please call us at 1-877-754-6411. We’re here Monday – Friday from 9:00 AM – 5:30 PM ET. When you call, please share your review profile name with our phone specialist so we can help you better. Talk to you soon! With the first use, most of my blackheads were removed. Overall, I’m mostly satisied with this product. We'd like to learn more about your experience with our product. Please give us a call at 1-877-754-6411, Monday - Friday from 9:00 AM to 5:30 PM ET. We look forward to speaking with you!